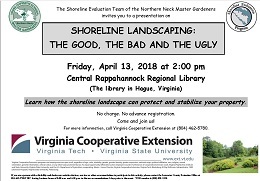 The Shoreline Evaluation Program of Northern Neck Master Gardeners will present “Shoreline Landscaping: the Good, the Bad and the Ugly” at 2 p.m. April 13 at the Central Rappahannock Regional Library, Newton Branch, 22 Coles Point Road, Hague. The program is free and advance registration is not required. This entertaining presentation by NNMG member Sue Lindsey will cover different approaches to shoreline treatments. The program will explore the range of plants suitable for shoreline properties from the water’s edge to more upland areas. The program also will offer opportunities for property owners to ask specific questions, apply for an evaluation visit, recognize common shoreline plants and learn about shoreline erosion management. Those interested in bringing plant specimens for identification are welcome to do so. 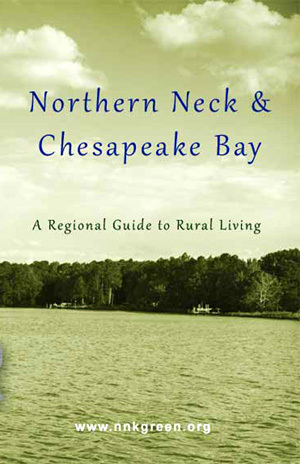 This presentation also will be offered June 8 at the Wicomico Church Parish Hall, 5191 Jessie duPont Memorial Highway, Wicomico Church.